The Man Mundil, Or Hindoo Observatory, Benares. bl.uk > Online Gallery Home	> Online exhibitions	> Asia, Pacific and Africa Collections	> The Man Mundil, Or Hindoo Observatory, Benares. 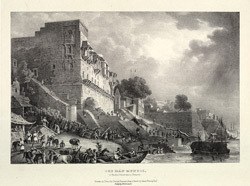 Plate 6 from the second part of James Prinsep's 'Benares Illustrated'. Prinsep (1799-1840), an antiquary and colonial administrator was assay master at the Benares Mint between 1820-30. The lithographs published in this collection were based on his original sketches of the various views of the 'holy' city of the Hindus. Of this view he writes: 'The "house of Man" forms one of the most picturesque objects for the artist's pencil, from the commanding altitude and antiquated irregularity of its front, enhanced by the expanse of never ending steps at its base, and a background well situated to the effects of light and shadow. Of one of the projecting balconies, a drawing was given in the first series: the rest are in a more dilapidated state, and the lower gallery is much corroded by the alternate action of the atmosphere and the river. The building was converted into an observatory by Jysing, A.D. 1680...The large stone azimuth circle is seen towering above the centre of the building...The rooms nearest to the spectator were the residence of the chief pundit, who had a small equatorial dial on top of his house, to serve, no doubt as his private chronometer...the group in the foreground represents a Mahratta family crossing a ferry'.